Last weekend we were happy to announce pre-sales of our limited edition sauces through our ETSY site and we are proud to say that more than 50% of the Limited Edition sauces were snapped up in the pre-sales phase. Now our full line of hot sauce products is now available in the * SAUCE SHOP *. There is a great variety of sa uces and packaging options ranging from the True Believers Collector’s Bottle set that features one of each of our great tasting sauces in our exclusive collector’s edition raffia wrapped bottles adorned with our signature mini sombrero, the Wild Side 3-pack gift set, to individual bottles of sauce in a variety of styles sure to meet the tastes of every consumer. Use the * SAUCE SHOP * Link at the top our our page, or get on over to our Facebook page and give us a LIKE to punch your ticket to Taco Heaven. The shop is also available directly on the Facebook page. Thank you to everyone who has already become a part of the Taco Jesus family, keep spreading the taco gospel so that we can get more disciples singing the praises of Taco Jesus! 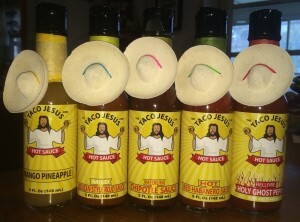 This entry was posted in Message from Taco Jesus and tagged hot sauce, limited edition, taco jesus, website shop by Taco Jesus. Bookmark the permalink.